Lunatecs Place 4th and Win the Team Spirit Award at CHS District Northern Virginia Event. 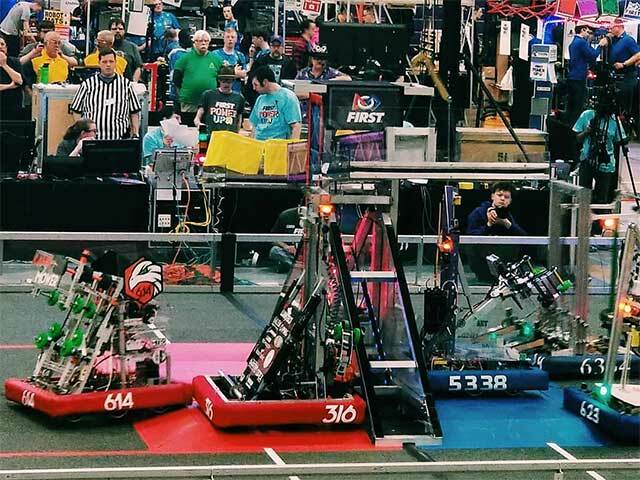 Although it tried, the March 2nd nor’easter that morphed into a “bomb cyclone” couldn’t stop the Lunatecs from attending their first FIRST PowerUp competition in Manassas, Va. The LUNATECS’ robot performed well, and they worked with their alliances partners to develop competitive strategies that worked. In the end, the LUNATECS placed 4th in the competition with a record of 12-4-0 and were the 3rd alliance captain. They made it through to the semi-finals but did not advance further. Throughout the competition and especially on the final day the team really got into the spirit of things. This enthusiasm and energy were noticed by the judges who awarded the Lunatecs the Team Spirit Award sponsored by FCA Foundation. Visit the Lunatecs Facebook page here.